First step for cooling tune up! 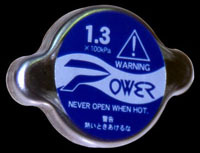 *FEATURE : cooling performance is improved according to high-pressure power! Keeps higher pressure inside of the cooling system and helps the coolant flow better. It has pressure capacity of 1.3 x 100kpa(1.3kg/cm2), while conventional cap has 0.9kg/cm2, this means the coolants boiling point can be raised by use of Power's radiator cap. It greatly performs on circuit racing of course, when overheating in a hot environment. Want this item shipped out tomorrow, April 19? Order within the next 16 hrs 54 mins.